In October we went on our first nature walk of the school year. In the weeks leading up to our walk, many children had begun to notice the changes that were happening outside. 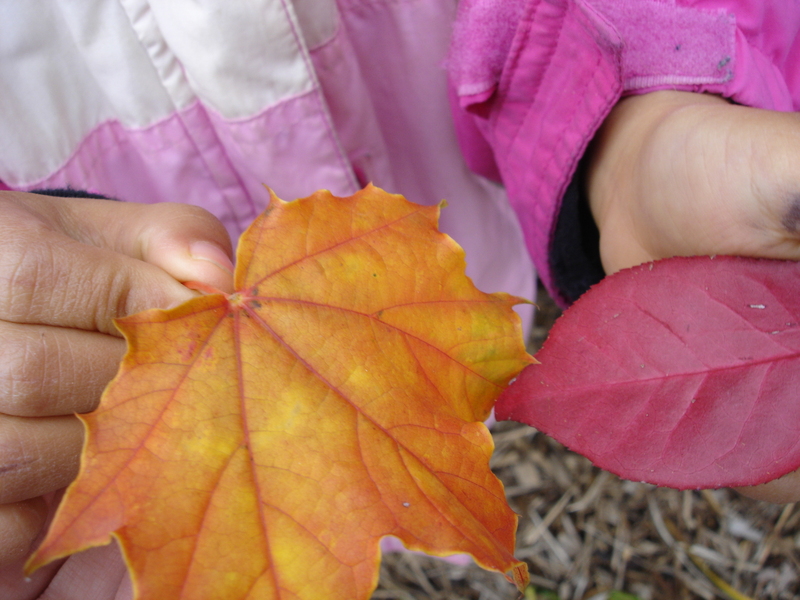 Leaves were being brought in to school, the children were wearing warmer jackets, and our special Maple tree out front had started to turn red. W: Yes, there is more than one kind of red. There’s red and dark red. E: And light red too. At this centre we placed our colour-sorted leaves, photos from our nature walk, paint chips from the hardware store, and paint for mixing. 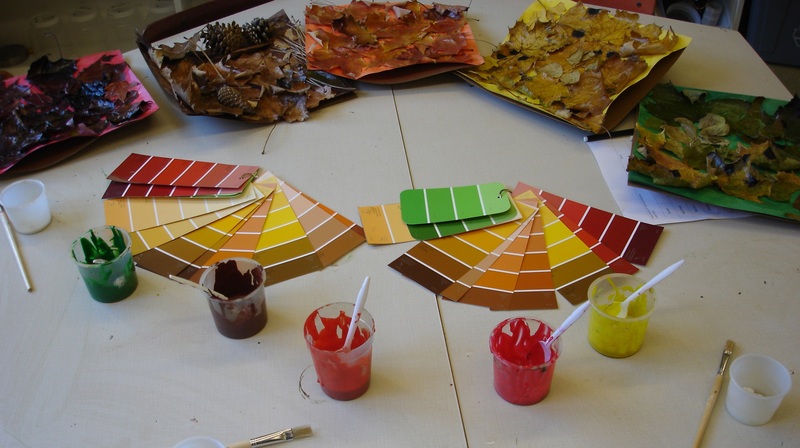 The children were encouraged to look at the objects on the table and create their own special fall colour. 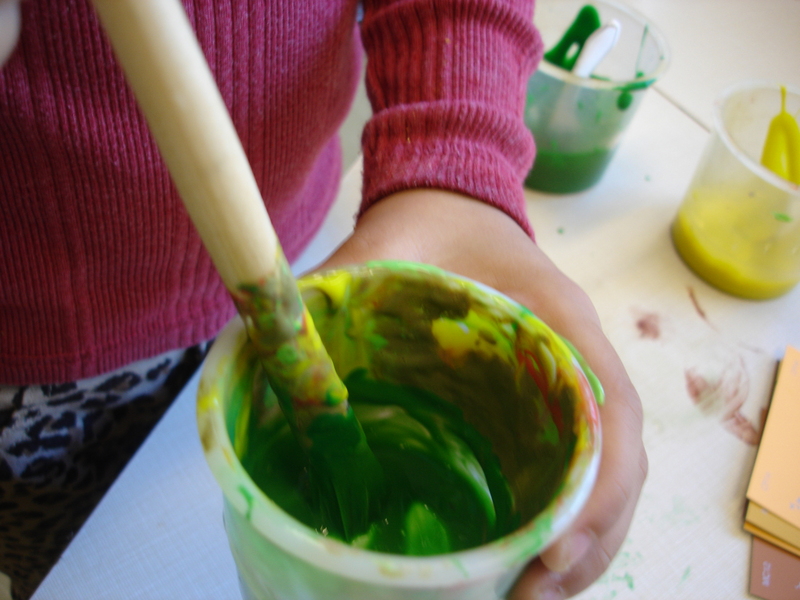 After mixing, the children were asked about their process: What colour did you make? What name might you give your colour? How did you make it? Where might you see this colour outside? When it came to naming their colour creations, the children were quite inspired by the variety of names we read off the hardware store paint chips – names like “brilliant sun,” and “orange fiesta.” These descriptions helped the children come up with their own unique names such as, “swamp green” (J.M. ), “Dark, dark, orange corn” (J.K.), “twirly brown” (W.W.), “dark super purple” (A.F.) and “jewel pink” (A.A). An important part of this project was documenting it. We decided to place the children’s paint samples (which they painted on small canvasses) along with their colour names and descriptions on the wall ‘gallery style’. We included in our documentation all of the artifacts and photographs that gave us inspiration for the project. The children love to look at the work they created. They particularly enjoy seeing the beautiful range of colours their classmates created. We can definitely feel that the idea of colour will be something we will likely revisit throughout the year. 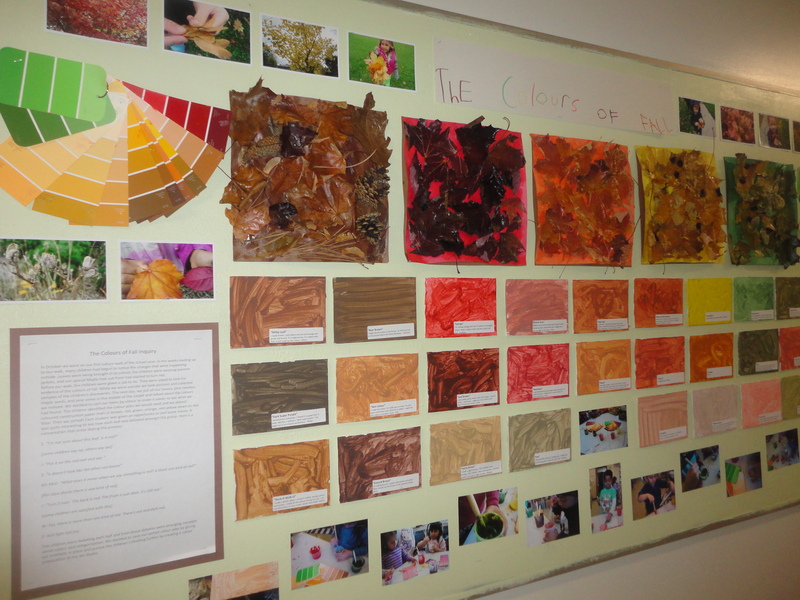 Has your class embarked on a colour inquiry? I’d love to hear about your experiences! 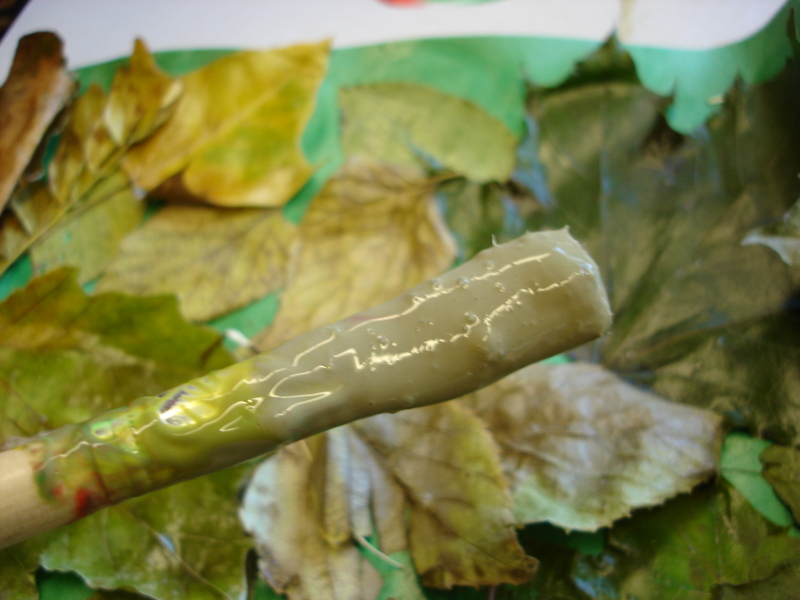 This entry was posted in Art Studio, Outdoor Classroom and tagged art studio kindergarten, colour inquiry, colour mixing, fall colours inquiry, nature inspired learning, outdoor classroom, Reggio inspired kindergarten by msmcdonell. Bookmark the permalink. I am just beginning my journey of transforming my teacher centred, themed based Kindergarten to a student led, Reggio inspired kindergarten (lots of thinking…). You’re blog is so inspiring and helpful. Thank you for taking your time to share your gift! Love this. I wonder how my three yos would do with something along these lines. I like the idea of starting with a nature walk and seeing where it takes us. Thanks! I think three year olds would love this! It’s such a hands on experience. And my three year old son’s favourite part of painting is mixing the colours together…Hope it works out for you! I love this idea, and I am wanting to do something similar with my Kinders. Did you have any issues with the leaves drying out and making a big mess? Did you press them first? Thanks Kim! Our leaf panels lasted all year without making a mess. We glued them down and the kids coated each panel with a white glue/water mixture that kind of sealed everything up. I stapled the construction paper to a cardboard backing to keep it strong. Hope that helps!